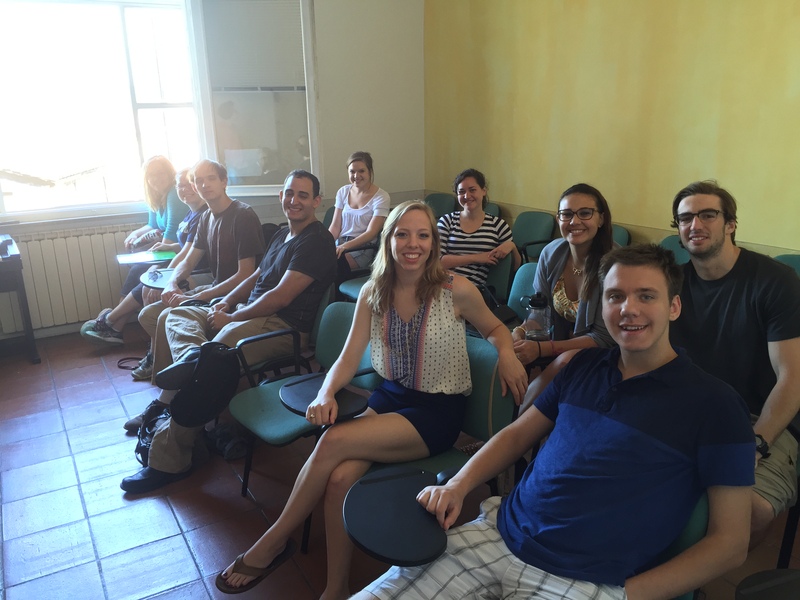 We are pleased to have ten students with us on the program, and after their orientation over the weekend in Perugia, we gathered this morning with our director, Giampiero Bevagna, for an initial set of lectures and a visit to the dig site. 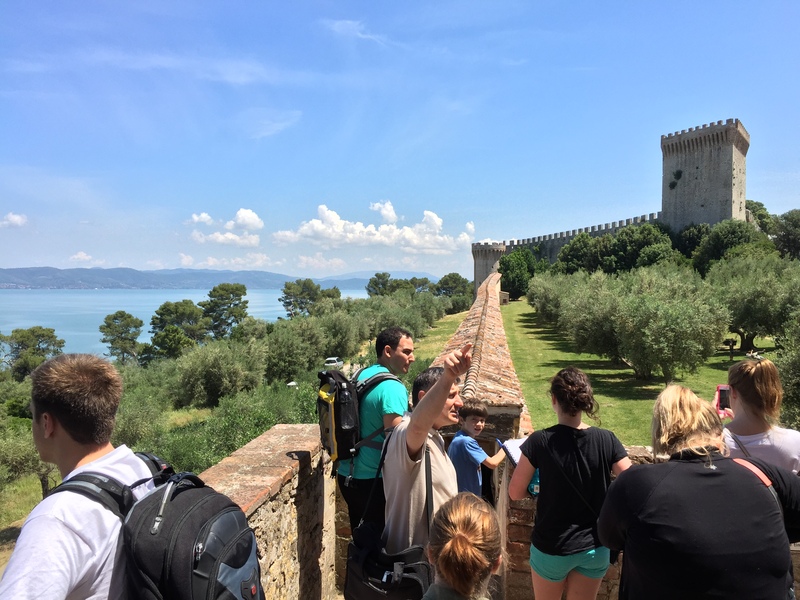 Our headquarters are in Castiglione del Lago, which we visited and wrote about twice last year. The town is as charming as ever; we’ve been allowed use of a university building for the student lectures. Our project is a bit different from the usual archaeology project model. 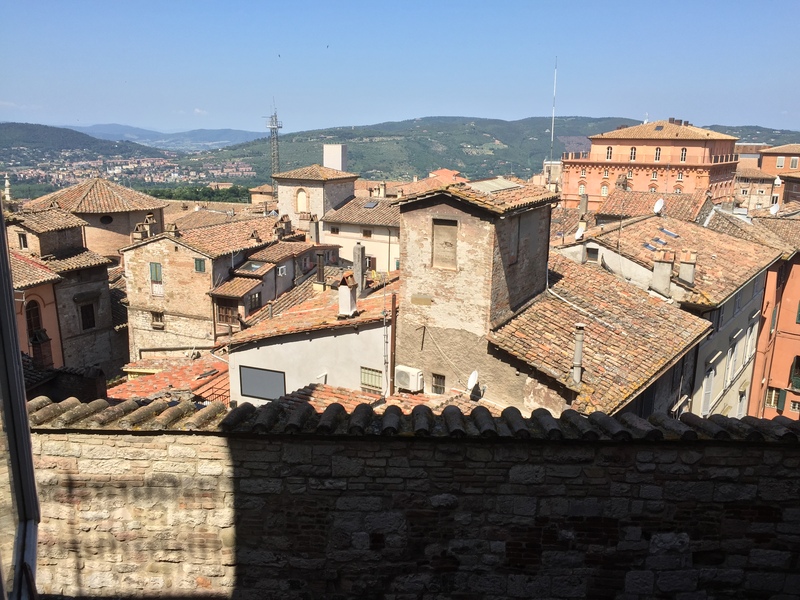 We are combining a field school (students earn credits) with a community outreach program (to help the comune improve their museum displays and pamphlets about local archaeology) and urgent research (essentially rescue archaeology for the Archaeological Superintendency of Umbria). 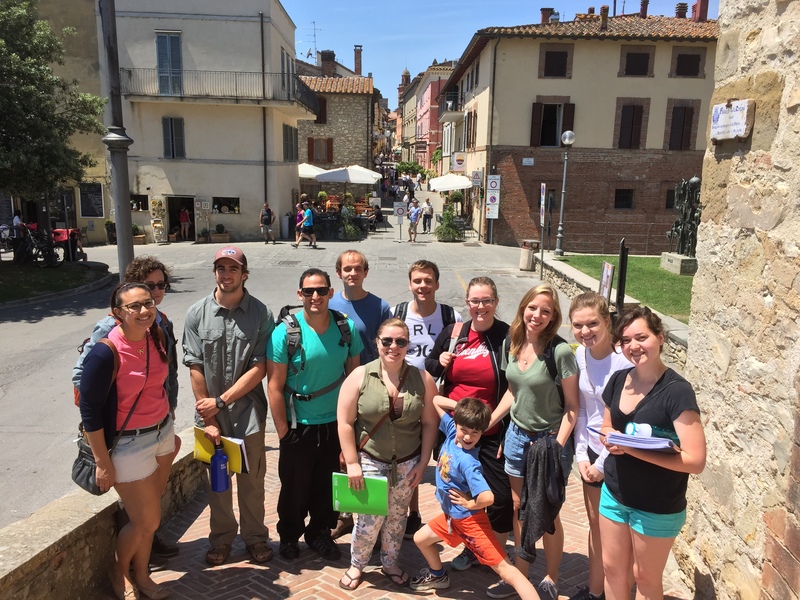 Instead of driving a research agenda, we’re listening to the Umbrian population and combining teaching, service, and research to meet their needs (and those of our students). After excavating around a small medieval church inside the town castle last year, this summer we have begun to investigate what looks like a Roman villa buried under a farmer’s sunflower field overlooking the Lago di Chiusi, some kilometers southwest of Lago Trasimeno. Centuries of plowing have done significant damage to the site, but enough might still be buried to offer a glimpse into the operation of this location. Painted plaster, amphora fragments, an iron nail, and loads of pottery and tile fragments were all visible on the surface, as well as some sections of walling. The proper stratigraphic process will begin later this week (which is interrupted tomorrow by Republic Day, a national holiday). 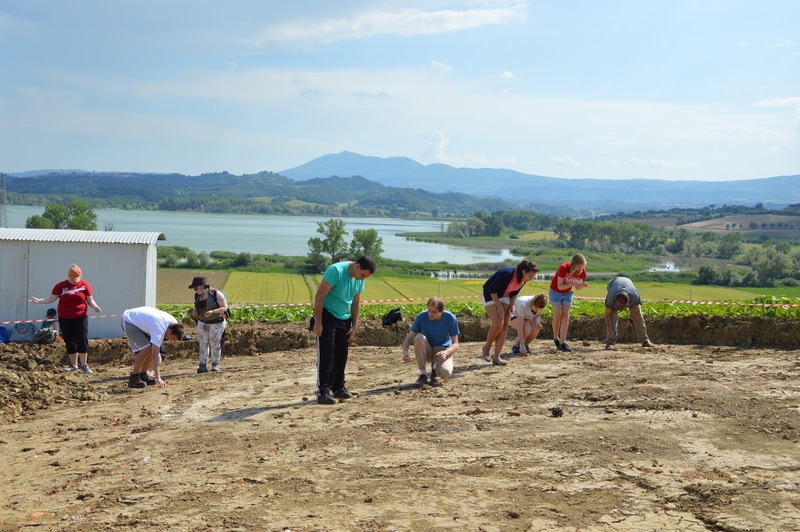 At our dig site, overlooking Lago di Chiusi, looking at the surface scatter of artifacts. We’ll be limited in what we can show in this blog; we can’t ‘publish’ important artifacts or features here before we submit official reports to the Italian authorities. But we’ll try to share a sense of what is happening as the project progresses. 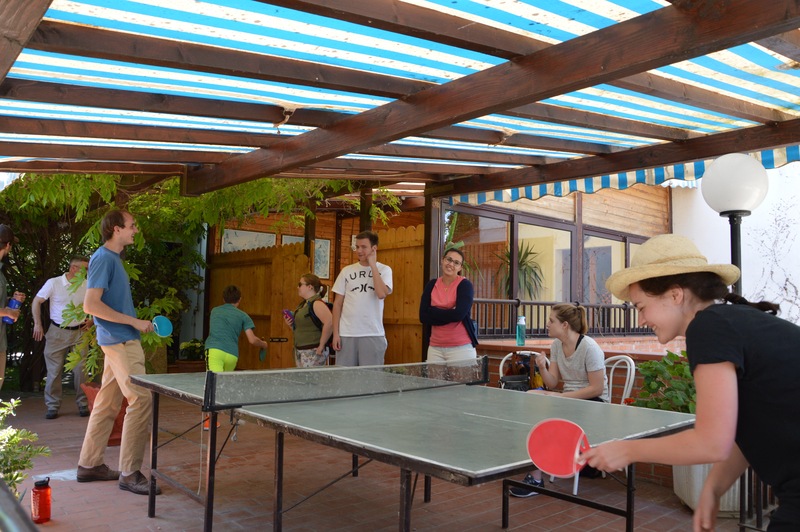 The days are long (and getting rather warm), but at the end the students can relax with a swim in the lake or a ping-pong game at their residence. Thank you for doing the blog I am look forward to following the group. This is a experience that my daughter Deanna will never forget as well as learn from it. Looking forward to seeing all the adventures! This is so exciting! Hope the summer is full of adventure! So proud and jealous of my little sister LOL! Keep up the good work!